Strike beans; love how they curl themselves from the soil. Spinach; looks plain but we've not had success so we are especially hopefully these grow to their full potential. The lettuce sprouts are a little blurry (from my photo, not from the ground), but they are abundant. The entire row is sprouting! Potato greens are pushing through the straw...I hope we get more true potato fruit this year. The mache looks good; this will be a real treat to enjoy fresh. Have you ever eaten mache? It's used like a lettuce, with small round leaves that are sweet, crunchy and thin like a spinach leaf. Yum! The turnips are sprouting at a wild rate, they definitely needing thinning. Yeah for the turnips, last year they were a little sparse. Following a gully washer of a night, we enjoyed our coffee while on the porch swing, grateful that the only damage we experienced was road erosion (it was significant, but it can be fixed). We were entertained by several goldfinch and a stunning rose-breasted grosbeak feeding upon the sunflower seeds I set out for them. They hung around for quite some time, giving us splashes of color as we enjoyed our coffee. Once they flew away, I could hear them singing in the woods, it was a lovely serenade. Click here to listen to the sweet melody of the grosbeak, you'll be glad you did. We expect to have more dangerous storms roll through this evening and tomorrow. Times like these remind me of how precious life is. I'm holding healing thoughts for all those who've been effected by these storms and am hopeful they experience a swift recovery. And looking forward to blue skies. When Johny and I were considering living this log cabin life, I came across a quote by Mark Twain--“twenty years from now you will be more disappointed by the things you didn’t do than by the ones that you did.” It had a significant impact on our deciding to come here over two years ago. I'm excited to share that once again, I've made a decision to "advance confidently in the direction of my dreams," (part of a favorite quote by Thoreau) and have accepted an awesome position with a non-profit organization on the west coast of Florida. When we moved here, we committed to a year of log cabin living. We enjoyed it so much that we decided to keep living this simpler life until I found the right employment opportunity. Well, this one found me, and as things continued to unfold, I knew it was perfect in so many ways. We've made this decision together, and it does mean change for us. The current plan is that he'll stay at the cabin with Pogo and Fluffy, keeping the garden going and bringing me fresh produce care packages when he comes to visit. I'll find a small place to live (have found a cute little villa for the transition) and come up to the cabin for long weekends and vacations. I've one more week before I leave the cabin. I'm sure I'll shed some tears as I drive away, and I've no doubt I'll miss my log cabin life. But I'd regret not taking this opportunity to make a difference in the lives of others. I'll continue writing my blog, though I probably won't post every day--I'm sure I'll have plenty to tell about my adventure and I'll also share cabin happenings. The life I'll be leading may not be my log cabin life, but it's still Lise's life, after all. The photo is a trillium, the first I've seen in our woods. I thought it appropriate, as this post is a first too. Thank you for your support over these past two years, you have made blogging a real joy! Molly Moocher is the mushroom lovers name for morels. A favorite amongst wild mushroom lovers. They look a bit like a brain, and taste like mushroom heaven. but it was one among many! This gets a big woo hoo; this is like mushroom gold! We sauteed them in a bit of butter. Sprinkled with parsley, we enjoyed the wild mushroom flavor that I can't even begin to describe. Have you ever eaten morel mushrooms? Have you hunted them? There's a nine mile stretch of Highway 64 that climbs from Franklin, NC to Highlands, NC, winding around the mountains like a creeping snake. If you love waterfalls, I highly recommend it. But for those of you who are squeamish about driving along a narrow two lane highway with rocks lining one side and a drop into a gorge on the other (yes, almost the entire way), I've got some pictures for you from our travels yesterday. The first fall when heading south toward Highlands is Cullasaja River Falls. There is a slight pull off spot on the side of the road for gazing and picture taking, a little scary when cars are speeding past faster than they should. It's a large fall that flows into the Cullasaja river in the gorge. Dry Falls offers a parking area and steps that lead you all the way behind and around the falls. Dry falls are huge and roar with their power. See the little red dot to the bottom left? That's Johny. ...but great fun because you can drive beneath the rock ledge and get behind the falls. Our final destination was On The Veranda, a relaxed yet elegant dining experience overlooking Lake Sequoyah . We don't go there often; it was nice to be back and we enjoyed our dinner and the atmosphere very much. This was the view from our table. We actually began our trip with a brief detour off Hwy 64 to peaks Creek. I've been emotionally drawn to this place since I learned of the 2004 disaster there and visited there in 2005. Fifteen homes were destroyed and five people lost their lives when a huge debris flow raced down the mountain into the holler. 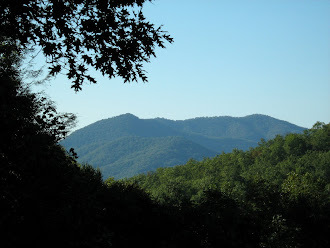 The photo is the initiating point on Fish Hawk Mountain for the disaster, where the earth let go, sliding down along Peeks Creek, collecting everything in it's path and building speed all the way down. You can read more here. The thought of it still sends chills down my spine, and causes me to grieve for the people in Oso, CA, who are still recovering from the recent mudslide there. At a distance (you can see it just to the left of the trees in the center). This handsome guy sat on this branch singing his heart out for quite a while. You can click here to listen and learn more about them. I enjoyed his serenade, though I'm sure it wasn't for me! Did you know Goldfinches are vegetarians? Sunflower and thistle seeds are their favorite. Do you have Goldfinches at your feeders? We love walking around and spotting new signs of spring and it seems that yesterday's rain followed by today's warm sun has everything popping. Johny and I have been watching closely because we were concerned that the recent freeze might have killed much of the new growth, but the blossoming buds prove otherwise (other than a few spots frost bite here and there). I do believe (and hope) spring is here to stay. We're thrilled that two of our apple trees, the Arkansas Black & Candy Crisp, have lots of blooms (the Honey Crisp doesn't have buds yet). We're thrilled because this will be the first year they produce fruit. The Dogwood are slowly unfolding their petals. The maple tree leaves have a beautiful red top when they first appear. We have lots of dainty gooseberry blooms this year (last year they were new planted and produced very little). Lots and lots of blueberries! Of course, springtime means planting. We're preparing the rows of mounds for seeds; the first things we will plant are carrots, spinach, and lettuce, all able to handle the cold. We've already planted our potatoes, and we have some beans sowed in the square foot planter we moved a few days ago (I hope we didn't plant them too soon, time will tell). Are you seeing signs of spring? We came across a small cairns (a stack of stones, you can see it in the lower right corner of the photo, on top of the big rock); I wonder who made it and why. I almost added a stone and decided against it because I didn't want to disturb it. Daisy Fleabane dotted the path along the way. We also saw Trillium and May-apple (those photos didn't turn out very well). ...my favorite of the walk today. We found a single morel where a bunch of old apple trees were. We left it there, but are excited to know they are popping up...these are some of the best mushrooms you can eat! Prostrate Bluets blanketed many areas. This log bridge bounced as we walked over it! The Sweet White Violets were beautiful. Unfortunately, the freeze a few days ago zapped the purple Violets. ...when you turn to look over the other side of the bridge, the fall seems to go forever. I loved the water splashing on this moss covered rock. I came across these Dandelion puffs as we were leaving; the place was covered with them and we were tempted to collect some leaves for salad, but we decided against it since we were in a national park. I hope you enjoyed a little taste of Deep Creek Trail as much as I enjoyed being there!